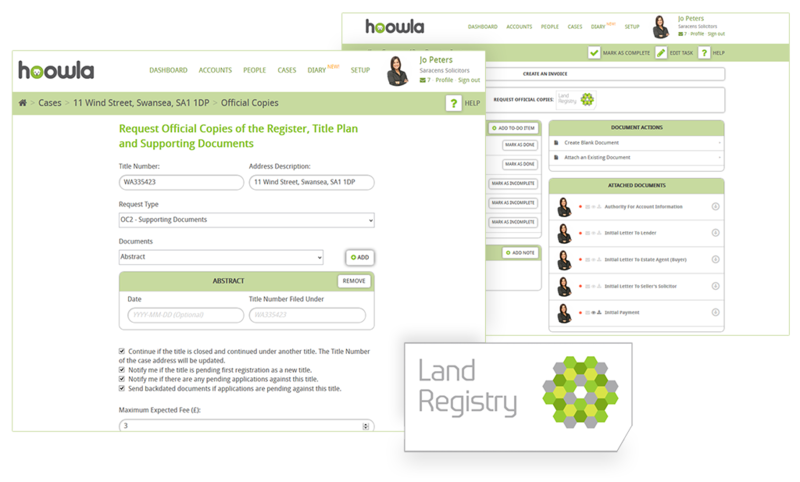 Hoowla announces the launch of OC2 in their continued integration with Land Registry Business Gateway. Clients can now request Official Copies of Documents from within Hoowla’s conveyancing case management software. Hoowla now provides the title number and tenure for properties via the Search by Property Description Service, requests for Official Copies of the Register and applications for Official Copies of Documents. All information and digital versions of documents are instantly returned and attached to the case where they can be downloaded and shared using Hoowla’s secure digital document system. All clients using Hoowla’s case management software have the ability to easily link up their Land Registry Business Gateway Account. Hoowla is modernising conveyancing for law firms and is a growing software provider for the conveyancing industry, developed in the UK and using the latest cloud technology. Hoowla promotes a modern approach to conveyancing with case management software that includes full accounts and invoicing, precedents and letters, search ordering, online SDLT submissions, dashboard reporting and more.